Effective meetings are important to your business to ensure that employees are aligned with your expectations and working efficiently. To run an effective meeting, you’ll need to plan ahead, know what you want to achieve, and create an agenda. We’ll provide steps for before, during and after your meetings to ensure they’re effective. You can use HR/benefits/payroll software like Gusto to store your meeting templates, along with other key business documents. In addition, Gusto can manage your employee payroll for half the cost of competitors like ADP. It’s perfect for small business. 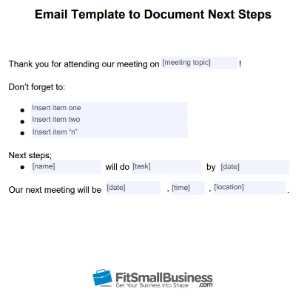 Our meeting agenda template includes placeholders for each step to conducting an effective meeting. You can use it as a guide to think through your agenda before the meeting, document topics you’ll discuss during the meeting, and plan for next steps after the meeting is over. Before you schedule a meeting, first decide what it is you want the meeting to accomplish and who needs to be there. A meeting is a way of conveying information—one that provides for two-way dialogue. It can be used to gather input on decisions or ensure alignment in the workplace. However, if you’re providing information and not seeking dialogue, a meeting may not be your most productive method of communication. Perhaps you could send an email, or record a quick audio or video message instead? It all starts with what you want to accomplish. A meeting should have a purpose, such as project updates, lessons learned, or customer feedback. If you can’t think of a purpose, there may be no need to meet. “Weekly or monthly” company meetings, for example, serve no purpose unless you know in advance what you want to get out of each meeting event. Is there information I need to share with attendees that is so complex that they’ll need to be able to ask questions about it? Are there decisions on which I need attendees to provide feedback? Are there concerns that I need to be sure everyone hears and understands so they can help fix them? Is there praise that I want to share in front of the team to motivate others to perform at a higher level? Are there project updates that team members need to know about, so they know what to do next? 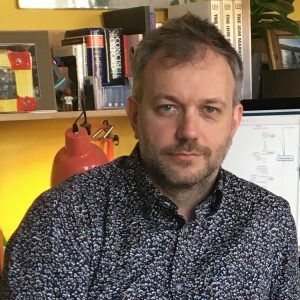 Does the team have information or insights that I or others need to know about? Are there training or safety procedures that need to be reviewed, updated or understood? To help prepare for your meeting, and confirm that a meeting is the best approach, develop an agenda. The agenda will outline what you want to accomplish, how much time you think it will take, and who will be the best person to present each topic and/or facilitate feedback on it. 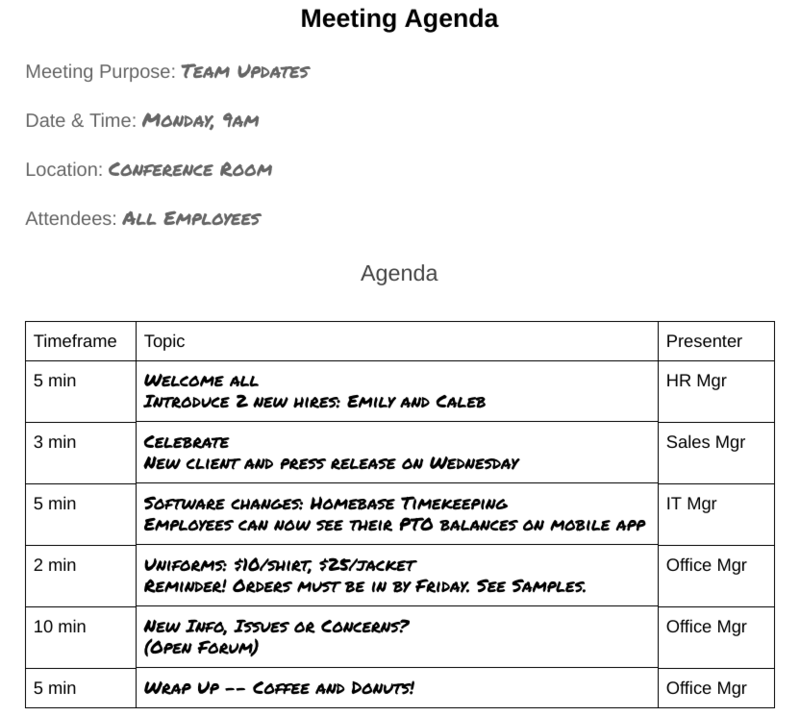 We’ve provided a simple meeting agenda template above, and an example below to help you think through your topics. 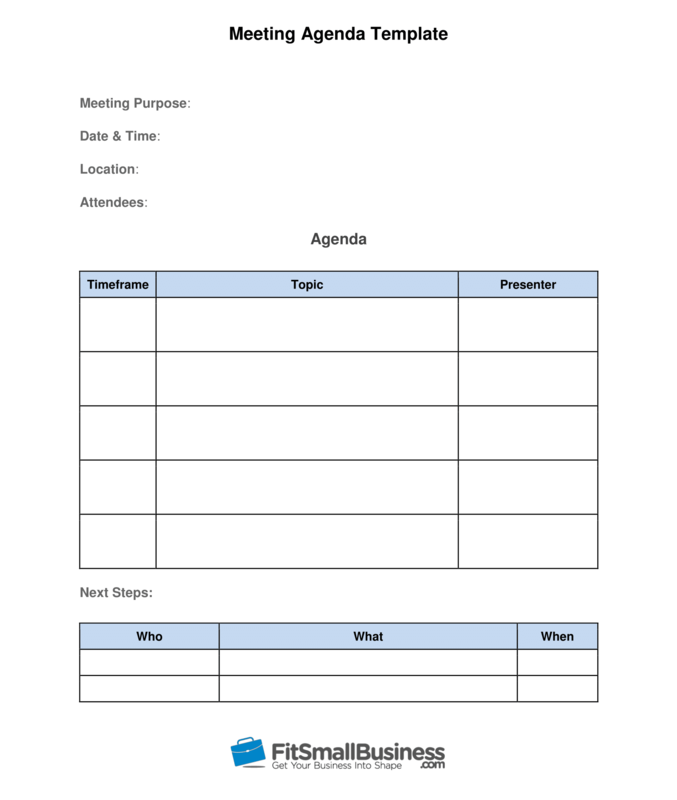 This agenda template can be used to guide you in planning your meeting and thinking through who needs to attend. I have always found that the most effective meetings are focused meetings. Go in with an outcome in mind and work backward from there—but also keep the unnecessary items out of it. Know what you want to take away from the meeting and structure the session accordingly by having an outcome-focused agenda. Sample agenda showing time frame and presenter. Many employees loathe attending meetings, because, frankly, they’re boring if the content is not relevant to the participants. Therefore, only invite to your meeting the people whose input or updates you need. If your meeting is meant to plan a project, invite those who have a stake in it. If the meeting is to get a decision, only invite those whose opinions will be considered. That may mean that you have more, but smaller, meetings. Instead of requiring a huge contingent of employees to attend a large team meeting, consider whether only a small part of the agenda pertains to them. Is so, conduct a shorter meeting on just that subject, with only the individuals whose input or buy-in is needed on that topic. 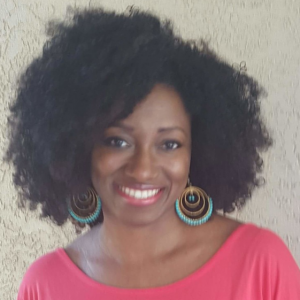 Do we need to meet in person, face-to-face? Does the meeting need to be in private (out of earshot of others)? Can we do the meeting via telephone conference? Would a meeting conducted via video conference better suit our attendees? If you’re discussing sensitive information or an issue that’s easily misunderstood, face-to-face meetings are best as they allow the meeting attendees to ask questions and read body language, as well as hear responses. Some meetings, such as those that cover financial information or employee changes like layoffs, may need to be held in a private area or offsite to prevent others from hearing confidential information. If your team is remote, the best format may be a video conference. That reduces travel and can get everyone in the same “room” much faster. Your meeting format can be added to your agenda template so that everyone on the invite list is aware of how you plan to meet. Scheduling the meeting is the easy part. But there are considerations to be given to remote employees, those that work in a different time zone or those who are non-exempt employees. You’ll also want to work around your peak business hours. For example, if you run a restaurant, you may want employees to come in early for a 30-minute meeting on menu and price changes. However, some employees may have day care or transportation issues before their shifts start. Or if you have employees who work in different time zones or shifts, you may need to schedule the same meeting multiple times to connect with all employees. If you have employees who work hourly, asking them to stay an hour late for a meeting may cause you to have to pay them overtime. 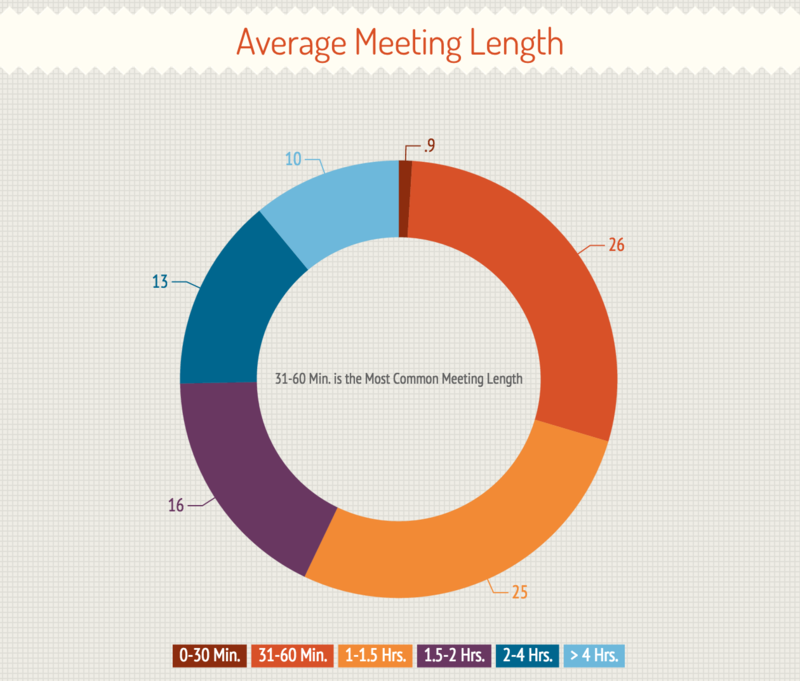 Most business meetings are scheduled for a one-hour time frame. However, the average adult’s attention span is only five to 10 minutes. You’re better off conducting shorter, more frequent meetings, and supplementing the meeting with documentation, pre-work, or follow-ups in a different format. For example, if your meeting is on sales targets, hand them out or email them in advance. Then, ask the sales staff if they have questions about achieving those targets. If you simply read the targets week after week, your attendees may zone out. Challenge yourself to have more focused, but shorter meetings by planning ahead what information will be provided, and keeping the meeting focused on those aspects that need discussion/understanding and interaction. In other words, if the attendees can read the information themselves, it may not need to be presented or read aloud in a meeting. Once you pick your time, a meeting is easy to schedule using an online calendar. Or if you’re already using a communication app like the free employee communication and messaging tools on Homebase, you can notify your employees that you’ll be having a meeting. To help you schedule your meeting as well as track time for hourly attendees, try Homebase. Homebase has free time and attendance software that you can sign up for, without having to provide a credit card. Read our review on Homebase. How you start and end your meeting are two factors that will improve your meeting effectiveness. As humans, we like to be social and catch up on what’s going on with our peers. Meetings provide a venue for that. However, too much socialization can be disruptive to your meeting agenda. If your attendees don’t otherwise get to see one another, consider asking them to join a few minutes early, so that your actual meeting can start on time. Some meeting planners like to start their meetings with a culture or team-building activity to take advantage of the face-to-face time that attendees have together. They consider team building or culture building part of their meeting purpose. But even if you don’t have relationship building on your mind, it’s helpful to greet your attendees as they arrive (no differently than you would greet customers walking in your door). Let them know what you’re hoping to accomplish. For example, you could say, “I’m glad you’re here. We’ll get started in five minutes. I’m looking forward to us all being on the same page after this meeting.” This helps focus your attendees’ attention on why they’re there. Leave phones outside. I have always been criticized for leaving my mobile on my desk or in my bag when I go in to a meeting, but it’s essential for keeping focus and attention on the meeting instead of external factors. Refreshments are for clients, not the team. Sounds harsh, but meeting time can be dead time when you’re catering and providing tea and biscuits. People wanting their next brew will be finished more quickly. Before you launch into your topics, ask the assembled attendees if there’s anything related to the topic that they’d like to make sure you cover. For example, perhaps one attendee has a question on how they ought to share safety concerns, or another wants to know where to find the MSDS. If you like the suggestion, you can add it to your agenda. If not, you can write it down and suggest it’s a conversation you’ll schedule later or one-on-one. In either case, you’ve made attendees feel like they’re part of the meeting, not passive bystanders. Work through each agenda item. You could kick each off, cover the topic, ask for feedback and move to the next item. Or you could ask that all questions be held until the end. A best practice is to engage your attendees during the meeting to prevent making your meeting a monologue. To do that, have different attendees take part in presenting the information, discussion topic or decision criteria. That way, you can facilitate the meeting, and your attendees have a stake in the meeting and its outcomes. It’s going to happen that someone will bring up a topic or concern that’s only tangentially related to the meeting topic, or not at all related. If you want your attendees to stay engaged, your best bet is to park those ideas on a parking lot, and offer to follow up later. Stay on message. It’s great when a team gets along, but talking about the football game or the latest bit of gossip doesn’t move things in the right direction. Drifting off topic wastes time and energy. 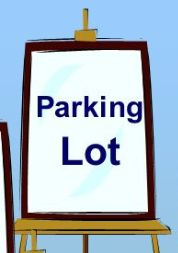 A parking lot can be as simple as a list that you keep on a notepad, whiteboard or flip chart. The point is that attendees can see their suggestion or comment written down, and are reassured that it won’t be forgotten. The first thing I do is ground myself by meditating and focusing on how I want things to turn out. This is especially important for introverts because our energy drains quickly. Next, I have a mapped-out plan to distribute an hour before the meeting. Once in the meeting, I set the expectations…including the importance of staying focused on the reason for the meeting. Finally, I leave questions/comments until the end. The benefit of leaving questions until the end is because inviting questions right away may lead attendees down a rabbit hole and can take away from the reason for the meeting. In other words, someone needs to own the follow-up for each action item, decision or next step. You can use the next steps section of our template above to document outcomes, decisions, and follow-ups. Assign an owner to each. It’s not a bad idea to provide a follow-up date so that each agreement made is completed within a specific time frame. Next steps should be documented at the end of each meeting. If it’s important enough to have a meeting on a topic, it’s important enough to follow up with it. You can do this by sending a quick email to remind attendees of what they’ve agreed to. Or you can schedule project tasks to be sure that next steps are taken and completed. For free project management software that can be used to track due dates and deliverables in any industry, consider using Insightly. Insightly allows you to configure your activities and workflow to meet your exact business needs. Here’s our review on Insightly, along with a free guide on how to set it up. If you want to determine whether your meeting was valuable, you might consider sending a feedback survey, asking questions like: What did you find most valuable? How could we improve our next meeting? Free survey tools like Survey Monkey are one of several free business applications that you might find helpful for your small business. Thank you for attending our team meeting! Here are a few follow-up reminders. Make sure to stop by and say hi to new team members Emily and Caleb this week! Those of you wanting to share the press release on your own social media page can do so after Friday. A link will be posted on our internet. Mark your calendar for our next meeting at 9 a.m. next Monday! If your first planning step (before your meeting) showed that you don’t really need to meet, but instead need only to convey information or get input, you might consider one of these other alternatives to hosting a meeting. Communication tools like phone, text, and email are obvious. But newer communication and collaboration tools allow you to accomplish many of the same things that a meeting would accomplish in much less time. For example, let’s say your sales team meets every Friday afternoon to recap sales for the week. Could that data be linked in a spreadsheet on Slack, or could a chart be forwarded from your CRM software? You could then shorten your meeting and focus on tips for improving sales, instead of hashing through the numbers that every team member can see or read for themselves. Free online communication and collaboration tools like Slack may be helpful to improve basic information sharing and answering questions that don’t require a meeting. Or if you’re using Homebase, you could use their messaging tools in addition to scheduling and time tracking. Homebase is free. Project management tools can accomplish what many meetings set out to do—keep everyone on the same page. The best project management software clarifies who does what, and when. It can also link to documentation, and let you know what happens before and after each task. Tools like these save countless hours of meeting time. Employees and team members can find the information they need on their own. Insightly is a project management software that starts at free for up to two users and can be used by small businesses to keep track of internal activities or to monitor projects for clients. Survey tools can be used in lieu of meetings to help gather employee data—from workplace satisfaction to tools needed to be more productive. In fact, they may be more effective than a meeting to ask the same questions, as some individuals (19.5 percent) are reticent to share their thoughts in a group meeting format. For example, let’s say you’ve just implemented new software, and have heard some grumbling. Rather than conduct a team meeting where only the loudest will share their concerns and others may stay silent, consider conducting a feedback survey instead. Determine what they like about it. Find out what they feel they want more training on. Ask what they’re struggling with. It could take hours to expose this information in a meeting, whereas a well-written survey may get at the key factors much quicker. You could then conduct a meeting to convey the results, along with your care and concern to the team. Then, use your meeting time to share how you’re going to address the software implementation issues. Zoho Survey is just one of many free small business tools. It allows you to conduct confidential employee surveys with up to 15 questions and 150 responses for free. Here’s our review of Zoho Survey. One reason many businesses and managers feel they need to meet with employees is to provide training. However, group training conducted in a meeting format only works well in two situations: new hires and new systems. New hires are learning your business and procedures. So that’s a good reason to meet with them as a group during their onboarding time frame. And, when you implement new systems as software or procedures, that’s another good time to go over the changes (and answer questions) as a group. Coaching and training don’t work great in a team meeting environment if some employees are newer and others have been around for a while. The reason is that the experienced employees will be bored (they already know the information), whereas the new employees will be intimidated (they don’t want to ask questions their peers might perceive as stupid). Therefore, if you’re providing coaching or training, it’s best to provide that in smaller, homogeneous groups, or one-on-one, where the information is relevant to each attendee, rather than in a large meeting. How Long Is Too Long for a Meeting? Of course, this depends. A tailgate safety meeting on a job site may be too long if it runs over 10 minutes and workers are eager to start work. Office meetings that last longer than 50 minutes often cause attendees to be late to their next meeting if meetings are scheduled back-to-back. What’s more important than the length of a meeting, however, is the structure of a meeting and the purpose of a meeting. For example, business managers may stay engaged during strategic planning meetings that last for hours—as long those meetings are well constructed, with lots of activities, breaks and interaction. We recommend focusing less on the meeting time frame and more on the meeting agenda to make sure your meeting is a valuable use of everyone’s time. What Is Meant by Meeting Management? Meeting management refers to the process of facilitating or hosting a meeting. As the meeting manager, your role would be to start the meeting on time, accomplish the business goals as listed on the agenda, end on time, and document action items. Often, the meeting manager is the one who schedules and does the post-meeting follow up as well. However, in larger companies, scheduling meetings and taking meeting notes may be delegated to a helper, such as an administrative assistant. Meeting management also requires that you can manage distractions to your meeting, such as a person going off topic. A best practice is to acknowledge distractions and off-topic discussions by suggesting that they be posted to the parking lot for follow up at a later time. How Is a Staff Meeting Different Than Other Meetings? A staff meeting is a meeting that’s designed for all staff to attend. It’s typically going to include policy updates, process changes and topics that affect all staff members. It may be structured to begin by celebrating accomplishments, introducing new hires, and then moving on to key events or dates. Your meeting may include new business, policy changes or lessons learned. Or, it may be used to address company issues. Staff meetings can be as short as a five-minute huddle at the start of each day or scheduled for hours offsite each quarter with all team members. How Should an Agenda Be Revised for a Conference Call? It’s easy for attendees in a phone or video call to be distracted in their location and lose attention during the meeting. Therefore, whenever possible, engage remote attendees by having them take part presenting part of the meeting agenda, or answering questions. Other than that, the agenda should be provided to remote attendees in advance, so they can follow along by printing the agenda or viewing it online. If you need help finding a video conference provider, check our review of the top three best for small business. In addition, if you want answers from remote attendees in advance, consider having them review documents or prepare responses before the meeting. This practice works well for in-person meetings too. By spending 10 to 15 minutes of your own time preparing for a meeting, you can often save time during the meeting. That makes it more useful for all those invited to attend. You’ll have shorter meetings, more effective meetings where actual work gets accomplished, and meetings that create results. Use the steps we’ve provided to make your meetings effective. If you’d like to schedule and track the time hourly employees spend in meetings, consider using time and attendance software like Homebase. Homebase has scheduling tools, time tracking, leave management tools, and even a messaging app that lets you send real-time updates to employees.